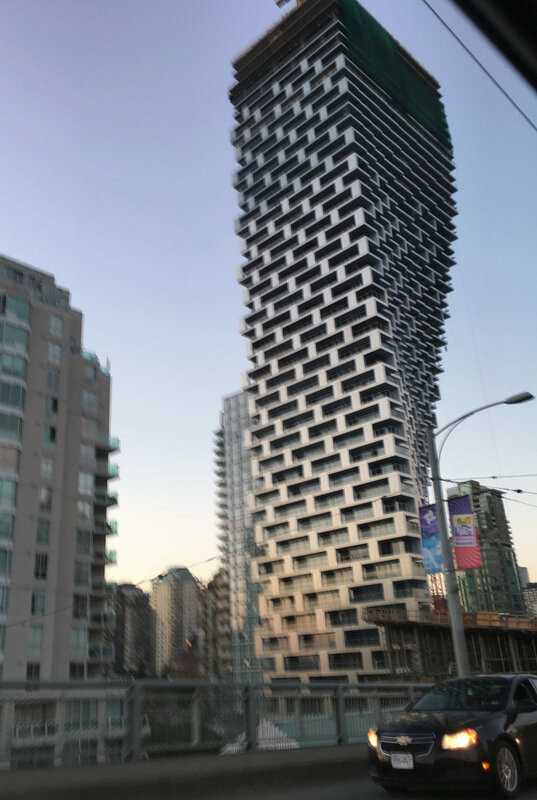 Inspired by Vancouver street art. . . Walking around the central part of the city of Vancouver, B.C., one encounters dozens of beautiful murals painted on every imaginable surface: under bridges, on the sides of buildings, on sidewalks. The quality of the art is amazing, and I find myself drawn to the brilliant colors and exciting color combinations. No surprise, as I am generally drawn to bright juxtapositions of color in my own work, and I sometimes must restrain myself to keep things more subdued and simple. There is also some pretty incredible architecture. . .the building pictured brings to mind an advancing twill weave structure in silvers and grays—-something different for me to try sometime. Nothing like a wedding. . . There is nothing like a wedding to celebrate and showcase beautiful handmade work! 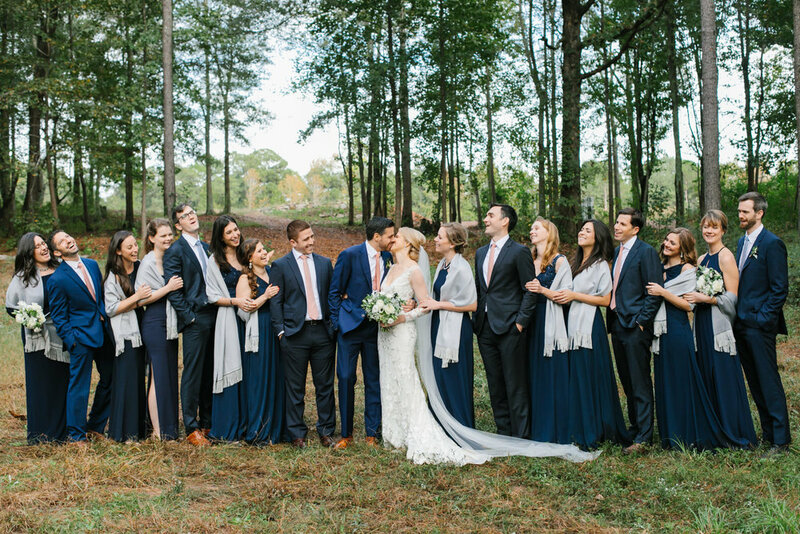 Our daughter was recently married outside of Atlanta, Georgia and she and her fiancé commissioned me to create coordinating shawls and handwoven ties for the entire bridal party and family! The shawls were made from tencel and were either predominantly silver or navy—-the bride’s colors. 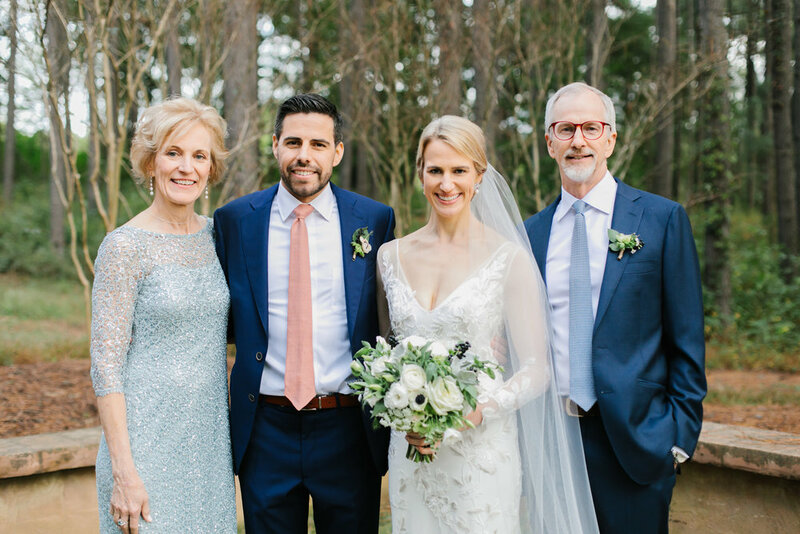 The ties were carefully planned through several consultations with my very dashing son-in-law, and were made from silk yarns: silver crossed with either coral or a gorgeous medium blue to coordinate with the navy suits. Eleven shawls and eleven ties resulted, and all were pleased at this lovely accent to a spectacular wedding! I had the chance to visit Dallas based Perennials Fabrics last week when my AVL loom cable broke and I was looking for help for a replacement. Perennials Fabrics creates high-performance textiles, and their design studio is right here in Dallas, Texas! All of the acrylic fiber yarn they use is dyed BEFORE spinning, creating a color fast, incredibly rich depth of color in the final textile. Several AVL looms fill their design workspace, and they are in the process of installing a brand new European jacquard loom that looks like something from the year 2050! Pictured below is the color fiber combination wall for their rug product line. Thanks so much to Cate, who helped me when I was having a "loom emergency!" 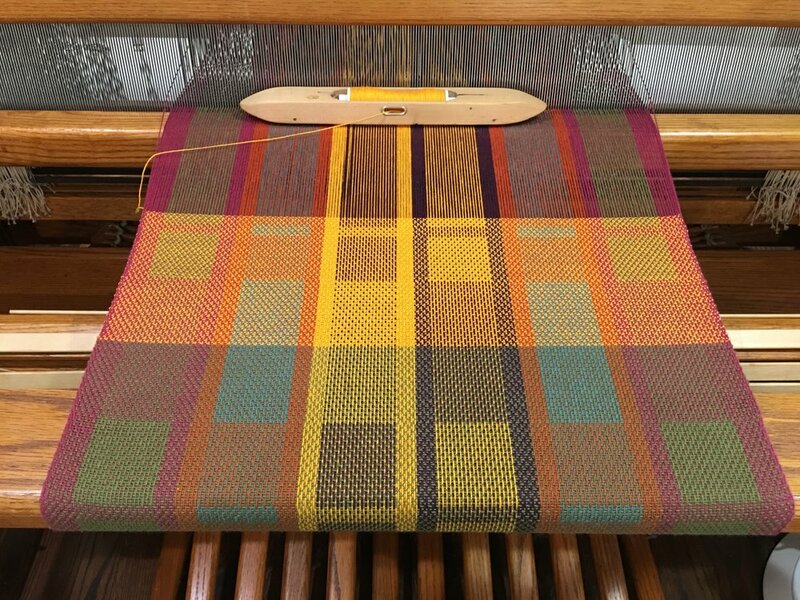 I just completed weaving a 21 yard warp of cushy 100% cotton in dozens of color combinations! This was a turned twill block design and I had fun playing with different size blocks and colorways. Fascinating to see how various colors interacted with one another as they juxtaposed (see Josef Albers, The Interaction of Color). This project was done on my most complex loom, a 16 harness AVL, and will be a collection for a special client. She is a potter who appreciates quality handmade functional items for the home. Specializing in large tapestry weaving, Les Gobelins has produced fine tapestries, rugs, and upholstery fabric since the 1600s. Beginning as a dye factory situated on a now underground river in Paris, Les Gobelins completed many fine weavings for royalty, including Louis XIV. At one point it became the royal tapestry factory, and is now under the oversight of the French government. The looms they continue to use date from the late 1800s, and it takes 4-6 years of apprenticeship before being hired as a weaver. This incredible small museum is located in a canal house in Amsterdam, with each room featuring the particular regional dress from different areas of Sweden. Pictured in these photos are household textiles as well as the hand painted vests each woman wore over her blouse. The painting was created by carving out cork plugs and dipping them in paint, via a simple printmaking technique. During times of mourning, women wore only black and white (for deep mourning) and blue and white (for later mourning). One could identify which towns and areas where people were from, simply by the style of dress and accessories. Windmills powered nearly everything in Holland back in the 17th century, except for looms, which were powered by human hands and feet (most modern looms still are!). Visiting a very old weaver's huis (house) where the weavers produced heavy duty sailcloth from flax, I got the chance to weave on an old loom from the late 1700s. At that time, men did nearly all the commercial weaving, as it provided a good living for hard working weavers, until mechanization became dominant in the mid 1800s. Gorgeous spools of silk yarn from the only remaining silk weaving production works in all of Sweden. The luminescent colors glow with light and excite the senses. The Sidenvåveri och Museum was originally a silk weaving factory founded by K. A. Almgren in the early 1800's. At its peak, the factory employed over 300 workers, most working directly with the looms (warping, winding, and weaving). Today, only one skilled weaver produces all of the handmade silk cloth that comes from this location. These weavers are hard at work, demonstrating the ancient style of weaving and continuing to prepare weaving for sale. They work primarily with wool warps and alpaca wefts. The fiber of the baby alpaca and the vicuna camelids is particularly prized. Nearly all the alpaca, llama, and vicuna in Peru are domesticated. The vicuna are shorn only once every two years, and it takes four to five animals to produce a kilo of fiber. Intricate weaving done on very simple backstrap looms, dating from about the year 800 C.E. This exquisite style of weaving is still practiced by a select few indigenous Peruvians in the highlands above the Sacred Valley near Cusco. 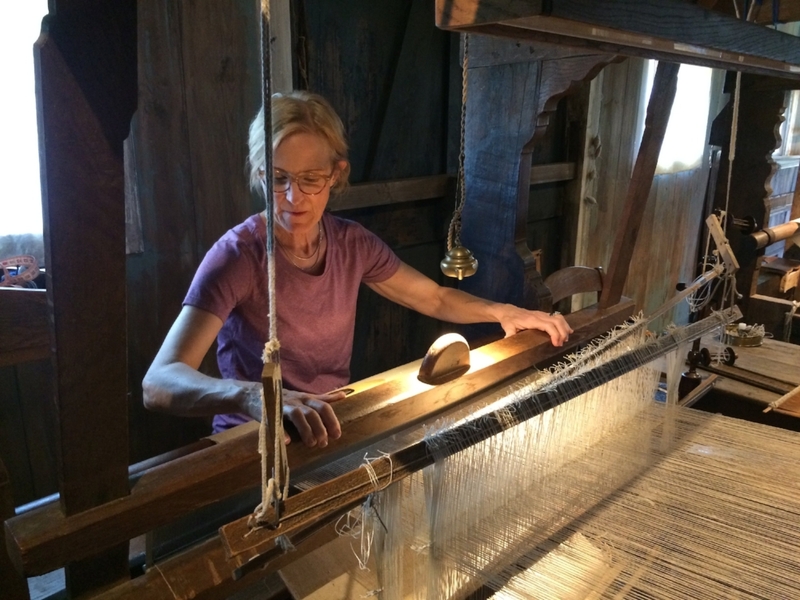 It takes a skilled weaver 8 hours to complete about 4 inches of weaving.